As news of the new track broke, we kept everyone up to speed with progress by posting updates on our web page. As we moved from the old website to the new site we transferred that record over to ensure those updates weren’t lost in cyberspace forever. MMP have had discussions with the council and other leasee’s of land down at the Aerodrome about the possibility of some land to build a purpose built track. Things are looking very positive for an agreement to be made. We also currently have resource consent as we are existing users at the Aerodrome so by staying on Aerodrome land we remain under the current recreational resource consent that the council has in place. Quotes for the work are being sought and a feasibility study will be carried out not too far into the future as it would be good to have a track built for the 2010 season. If anyone has a million dollars or knows anyone who would be keen to sponsor a portion of the money please contact Bob Wilton on 06 377 3803. After many months of planning and fundraising, the earthworks for the new Masterton based drag racing facility has begun. “We feel this is the biggest thing that has happened for drag racing in many years – this is the first time a purpose built drag strip has been built in NZ for 35 years, the last one being Thunder Park Hawkes Bay” said MMP’s head Bob Wilton. Masterton Motorplex International Drag Racing track was started on Thursday by Oldfields, one of the main contractors involved in the construction. The project has been split into three stages; stage one is the race track itself, while stage two will include a sealed pit area, with stage 3 adding all other necessary amenities. 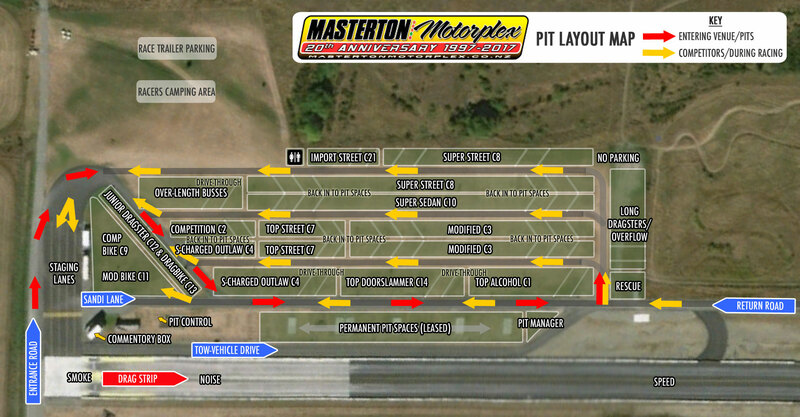 The total land area is 33 hectares, which will be leased by Masterton Motorplex from the Masterton District Council. It is expected that stage one will be completed by April 2012 dependant upon funding, which will allow racing to commence on the new track. Photos: Above: The proud MMP committee with one of the Oldfields earthmoving machines at the location of the new drag strip. Below: The MMP committee and helpers at the first working bee held at the new location. 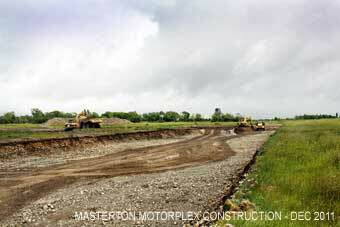 More photos have been released showing the progress of the earthworks for the new drag strip. The machines are currently digging down to the desired level, and crushing what they take out ready to put back in in January. At that stage it will look like a drag strip, just without the tar-seal! And also – if you or someone you know can see the value in their business being associated with this countries newest and highest quality drag racing venue, and you are interested in being a corporate or naming rights sponsor, or if you have any other proposal, please contact Bob Wilton directly. TRUST HOUSE GRANT APPROVED – $200,000 TOWARDS NEW STRIP, AND MORE! This week, the Masterton Motorplex team has had some great news! Trust House, a Wairarapa based licensing trust, has awarded Masterton Motorplex a whopping $200,000 towards the construction of the already underway new drag strip. This is fantastic news for the MMP team, and also for a large number of keen racers, all eager to have the new venue up and running as soon as possible. In another huge show of support for this exciting new venue, local earthworks company Oldfields Higgins has agreed to reduce the cost of the ‘stage 1’ build of the track by a whopping $100,000. Masterton Motorplex would like to thank both Trust House, and Oldfields Higgins for their continued and generous support of the new Masterton Motorplex Drag Strip. New Drag Strip – Stage One Funding Completed! It is with great pride that the Masterton Motorplex Board announces that the level of funding required to complete the new drag strip to ‘Stage One’ has been reached. The expectation is that the earthmoving and roading contractors will commence with the final earthworks in the coming weeks, followed by the sealing of the drag strip, and final preparation in time for a tentative Grand Opening date of January 2014. Stay tuned for a new website with progress reports and updates in the lead-up to this exciting event! All competitors, spectators, supporters, and race-­-day sponsors. Construction of the new Drag Strip is well underway, with the first section of concrete being poured, and preparation for further work progressing well. We’ll have more details and pictures soon, so please stay tuned, and check out our event dates for early 2014 here! DRAG STRIP ALMOST COMPLETED, READY FOR TEST & TUNE! The Masterton Motorplex crew are pleased to announce that the main track seal and concreting is now complete, with 165mtrs of concrete in the start-line/launch area! The track is 20 metres wide, and 900 metres long. Following the finish-line, the track transitions to a 1% up-hill gradient, to help slow vehicles. The pits have now all been leveled, rolled and grassed, as has the spectator area. Pre-stage will consist of a sealed area of 20 metres by 70 metres, which will allow 4 lanes of pre-stage vehicles. The 1.2km access road has now been started. This will be gravel initially, primarily to keep costs down. We hope to see you all at the track soon – check out our event dates! The Pre-stage area is now completed, ahead of the test-and-tune meeting! The pre-stage was finished yesterday. It’s 4 lanes, 20 metres wide by 70 meters long! GRAND OPENING MEETING A HUGE SUCCESS! The new track Grand Opening took place on the 15th & 16th February 2014, and went off without a hitch! The new venue proved to be a hit with racers and spectators alike, with glowing reviews from all corners. There’s plenty more to come, with this being only the first of three stages in total, so watch out for more good things to come! Please enjoy this selection of photographs from the opening meeting from track Photographer Justin Hansen.